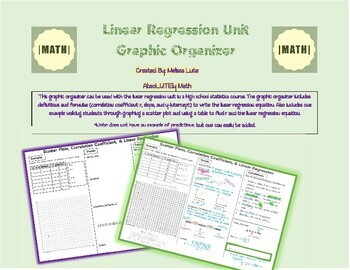 This graphic organizer can be used with the linear regression unit in a high school statistics course. 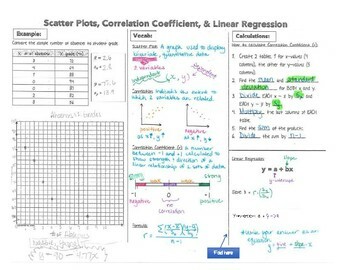 The graphic organizer includes definitions and formulas (correlation coefficient r, slope, and y-intercept) to write the linear regression equation. Also includes one example walking students through graphing a scatter plot and using a table to find r and the linear regression equation. *Note: does not have an example of predictions, but one can easily be added. Depending on the level of your students, this can be done in one day, or broken up over 2-4 days.